We moved back to St Kilda, settling in a flat in Hotham Street where we lived for many years. Well, almost. We were in flat 7 on the ground floor, before moving upstairs to flat 11. Later on we moved around the corner onto Inkerman Street. During this time, Balaclava was our local station, though for going to the city or to Prahran, it was easier to catch the Hotham Street bus (then route 602, now route 216/219) which stopped only a few doors up the street, and we’d catch the 69 tram (now the 16) to St Kilda Beach. We did use the train to go to Hampton though, where for a while we had swimming lessons in the gym next to the station. I recall after swimming lessons we’d get some lunch or a snack from a nearby bakery, then go to the toy shop and see if we could afford any new Lego sets with our pocket money. Balaclava used to have old wooden buildings, until one morning they burnt down, and were eventually replaced with the current pebblemixed ones. There’s an upgrade programme funded to happen, so they may get replaced at some stage soon. These days the bridge has a nice sailing ship sculpture thingy on it, but for years it was plain metal and had “Scratch out Fraser, the seven year itch” spray-painted on it. We moved to Elwood in 1982. My usual trip to school in years 6 to 8 didn’t involve trains, so we only used the train for trips to the city, usually via St Kilda station. We’d catch the 600 bus (which long ago had been a Victorian Railways tram route), which at the time ran quite a good service, I think every ten minutes in peak. It would go down the Grey Street hill and into the station forecourt. A clock visible as you came down the hill would indicate how long you had to wait until the next train… usually only a few minutes, as the bus was timed to meet it. And the buses would be waiting again in the evening for the train from the city to arrive. In those days I predominantly recall red rattler (Tait) trains, and it was common for those alighting from the arriving train to open the door before it came to a stop, and jump off quickly to get a seat on the bus, which could get quite crowded. Sometimes there’d be two buses waiting to cope with the loads. This isn’t a railway station any more of course. 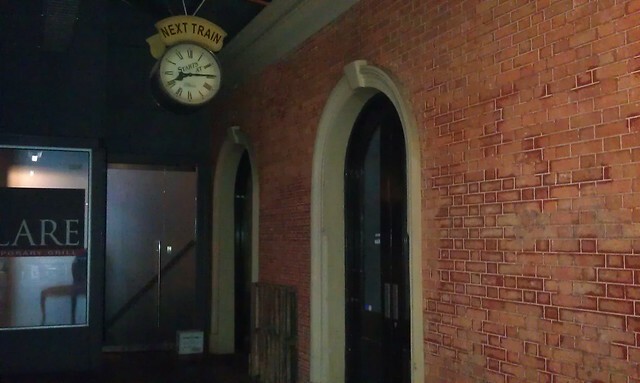 It was closed and the line converted to “light rail” (eg tram) in 1987. Nowadays there are various business in the old buildings. 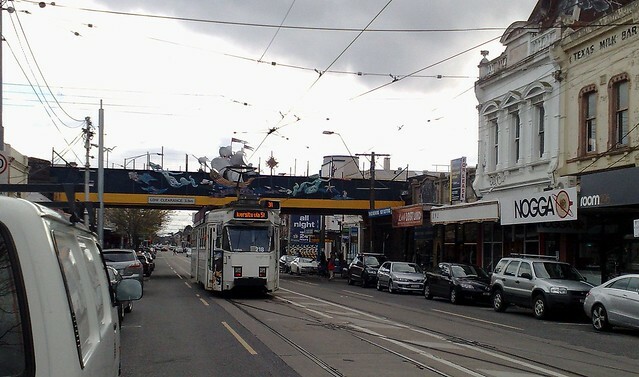 Even outside Grand Prix time, the tram is so busy one wonders whether its conversion was actually a good idea — they obviously didn’t see the gentrification and rising urban density in the area coming, nor the new generations of CBD white-collar workers who would move into St Kilda in swarms… not to mention the hordes who descend on the suburb every sunny weekend. 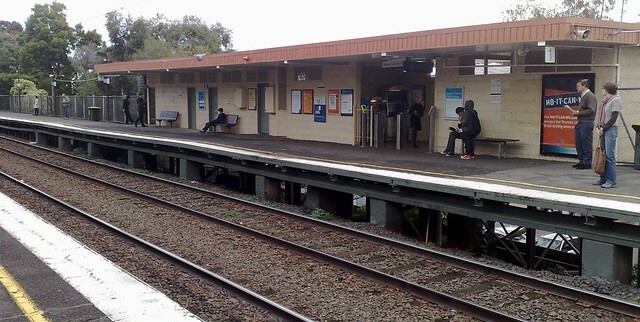 But by year 9, I was heading off to Melbourne High, and the school trip became a walk to Glenhuntly Road to catch the 246 up to Elsternwick station, then train from there to South Yarra. I probably should have just walked the trip via Bent Avenue; it may have been quicker. Often I’d see a girl from Star of the Sea waiting at the same bus stop. I seem to recall I was too shy to ever speak to her. I wonder where she is now. I recall a mix of blue trains, silver trains and the brand new shiny air-conditioned Comeng trains at the time. The station hasn’t changed much, apart from the apartment block where the ground-level carpark used to be, but there did use to be huge advertising billboards in the middle of the platform. Later we moved into a flat above a shop in Elsternwick, and the walk to the station became a 5 minute stroll, though I also used the station interchange to catch the 246 bus to Acland Street in St Kilda, to buy magazines at the excellent (sadly now closed) Village Belle Newsagency, buy the odd record at the record shop (though there was a smaller one in Elsternwick) and play video games at Luna Park. While I should, I cannot remember the ‘scratch out Fraser’ graffiti. From what we learnt when the government took over the 602 bus (and the 600? ), they were life threatening unroadworthy vehicles as you travelled about on them. 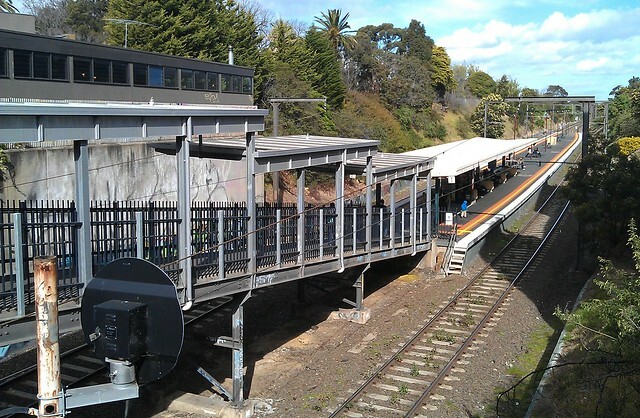 We seem to have been hearing about a makeover of Balaclava Station for rather a long time, yet as I passed through there Saturday, no action was apparent. Interesting post. Route 600 actually running at a reasonable frequency? Did pigs fly at the time too? @Terry – 600 was roughly SmartBus frequencies (a bit better on weekends) until c2000 when it was split into 600/922/923. The odd numbering to preserve the relationship with the shortened 822 (and possibly 823). Before that the 822 was an odd hairpin from Chadstone to the Brighton area via Southland and Sandringham. It was a retrograde step that made a legible corridor illegible. I remember the 600 piling down the Grey St hill with the driver furiously pumping at the brakes trying to get the bus to stop. They were really crappily maintained. There was a rumour that the Melbright owner used to slip a few slabs the way of the roadworthy inspectors to get them through. Anyway, once the government took them over they apparently learned the true state of the buses and they were all declared unroadworthy. A whole bunch of ancient green 1950s looking ex-MMTB buses were dragged out of storage to replace them. They were kind of cool, with a manual back door (i.e. the driver just unlocked it and you pushed it open yourself to get out).